Find phlebotomy training classes in Georgia below! Considered an integral part of the medical and clinical teams, phlebotomists are expected to be compassionate, caring, responsible, careful, and good with people. Patients, especially ones who are afraid of needles, are often nervous, scared, anxious, or unsure. It should be the goal of a good phlebotomist to comfort their patient, keeping the conversation rolling to banish fearful thoughts while drawing an adequate sample. This two-part phlebotomy training program provides an introduction to the fundamentals of phlebotomy, as well as clinical phlebotomy. Students must complete classroom training before advancing to 200 hours of clinical practice, during which phlebotomists-to-be must perform 100 successful venipunctures and 25 successful skin punctures. After the completion of this class, graduates are eligible to take the national certification exam to become full-fledged, certified phlebotomists, capable of working in professional, reputable medical settings. While drawing blood and processing bloodwork are important parts about pursuing a medical career as a phlebotomist, compassion and a genuine want to help others are the driving forces behind the decision. Phlebotomists-to-be at Atlanta Tech are tasked with 24 credit hours of on-campus learning, classroom lectures, and lab work. Afterwards, students are required to participate in clinical practices for up to 5 credit hours, learning the how-to of venipuncture and skin puncture. This phlebotomy training program has been approved as an education course toward earning a national certification as a phlebotomist. Students of this course must be 18 years or older, have earned a high school diploma or equivalent, achieved the minimum scores in reading, English, and math, and they must maintain a 2.0 GPA throughout the program. The Tender Care Phlebotomy Program is designed to help students break into the medical career via becoming a professional, knowledgeable phlebotomist. This training course covers a wide range of topics, such as the basics of phlebotomy, medical jargon, infection control, and interpersonal communication with patients. Throughout the program, students will be asked to participate in hands-on demonstrations, practicing venipunctures, skin punctures, and blood collection. This clinical experience plays a major role in the success of Atlanta Tech pupils, and students are expected to be able to demonstrate their knowledge of safe phlebotomy before graduating. This phlebotomy training course requires 10 weeks of classroom lectures and lab studies, followed by 2 weeks (or 80 hours) of clinical internship. Afterwards, graduates are welcome to take the national certification exam to become full-fledged, official phlebotomists of the medical field. Columbus Tech uses their Phlebotomy Technician Certificate Program to prepare medical students for entry-level positions in the clinical field. 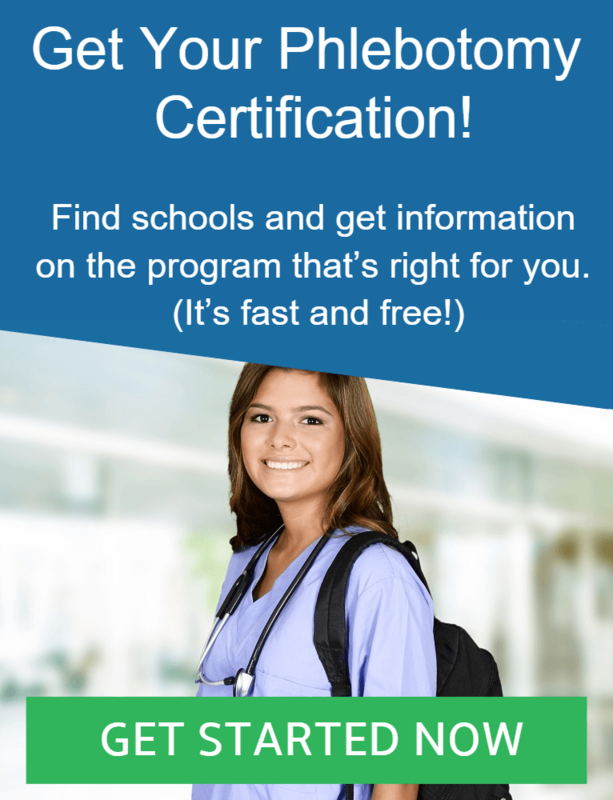 Upon acceptance into this program, students will learn the importance of sticking to safety standards, as well as the proper techniques for blood collection, bloodwork processing, and specimen transportation. This phlebotomy training course boasts 24 semester hours with topics that include anatomy and physiology, an introduction to healthcare, medical terminology, an introduction to computers, the fundamentals of English, and an introduction to venipuncture. After the classroom lectures and on-campus lab studies, students will practice their phlebotomy knowledge with clinical practice before pursuing certification from the American Medical Technologists. Dalton State College offers a unique phlebotomy training program for those seeking a stepping stone into the medical field. This program gives phlebotomists-to-be the opportunities to interact with real patients, practice on fellow students and volunteers, and learn beyond the basics of phlebotomy. To graduate, students must complete 17 total hours of hands-on practice and classroom lectures, plus 5 hours of clinical time. Those participating can choose to attend classes full-time in two semesters, or the course can be broken into three semester to accommodate students with busy schedules. Those who graduate are encouraged to take the national certification exam towards becoming an official, certified phlebotomist. Aside from drawing blood and processing bloodwork, Dalton State College students learn how to interact with patients on a personal, yet professional, level. Many patients are scared of needles or petrified of having their blood drawn. This is where phlebotomists can use comforting, calming techniques to soothe patients, while still collecting the necessary, adequate samples. Life Solutions for Health offers a unique phlebotomy training program that strives to educate medical career hopefuls in the basics of phlebotomy, medical jargon, clinical lab safety, and bloodwork processing. Phlebotomists-to-be are expected to attend the full-length of the 6-week program, and are encouraged to seek an externship in a clinical setting before taking the national phlebotomy certification exam. Tuition includes a textbook for classroom lectures, where students will learn about venipuncture, skin punctures, and finger sticks. Students will also learn how to handle nervous, scared, anxious, or upset patients, soothing them with interpersonal communication skills and innate compassion. Graduates of this phlebotomy training program will become certified on-campus at the Life Solutions for Health training center.